Earl's Fuel Shut-Off Valves - are designed for a maximum 350 psi and manufactured from chrome-plated brass or red anodized aluminum. These shut-off valves are ideal for use as an emergency fuel shut-off, anti-theft device, or drain. They're available in 3/8 in. and 1/2 in. NPT sizes. Earl's Check Valves - are designed for a maximum of 1250 psi at up to 400 degrees Fahrenheit and made of anodized aluminum with a reinforced Viton flapper valve. These check valves are perfect for applications requiring a one-way check valve to keep the fuel system primed. 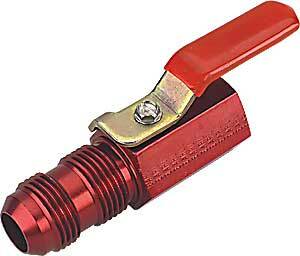 Earl's Fuel Check Valves can be installed in-line in -4 AN, -6 AN, -8 AN, or -10 AN fuel lines.